Sathish Caught By Sivakarthikeyan While Using Twitter In Shooting Spot !! Hilarious Video !! Sivakarthikeyan last film Seema Raja didn’t meet the expectations of the fans but he made his comeback with his own production venture Kanaa. Though he didn’t play the protagonist in the film, his role was crucial to the story. Now, he is all set with his new film with Nayanthara, which is titled Mr Local. The first-look poster has Siva in a suit but exhibiting casual and devil-may-care attitude. It is said that Mr Local is inspired by Rajinikanth’s superhit film Mannan, which had Vijaya Shanthi in the lead female role. Directed by Vasu, the film is about the cold war between a rich wife and a labourer husband. Hip Hop Tamizha duo is composing the music for the film, which is directed by M Rajesh of Oru Kal Oru Kannadi fame. Recently Nayanthara had finished her portions for the film, the film’s shooting is ongoing with Sivakarthikeyan and Comedian Sathish. 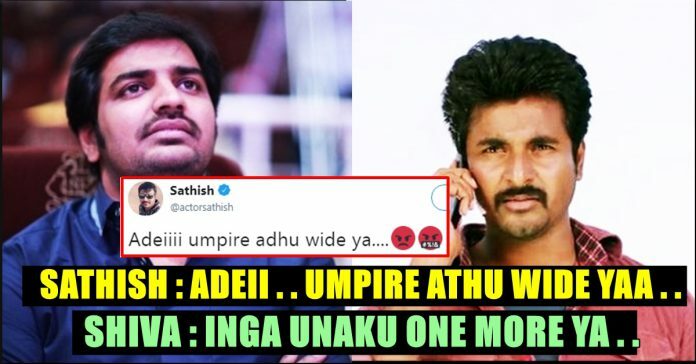 Sathish who is very much active in Twitter, in an urge, yesterday posted a tweet about the cricket t20 match which went between Indian and New Zealand. He also committed as Cinematographer for Sivakarthikeyan’s upcoming film which is tentatively titled as SK15. The film is to be directed by P.S Mithran who gave successful film Irumbuthirai with Vishal. Comment your views on this hilarious conversation !! Previous articleGuy Criticized South Indian PUB-G Players !! Check Out The Reactions For Him From Down South !! Next articleThis Role Model Celebrity Who Worked With Rajinikanth In Thalapathy To Rejoin !! EXCLUSIVE ! !